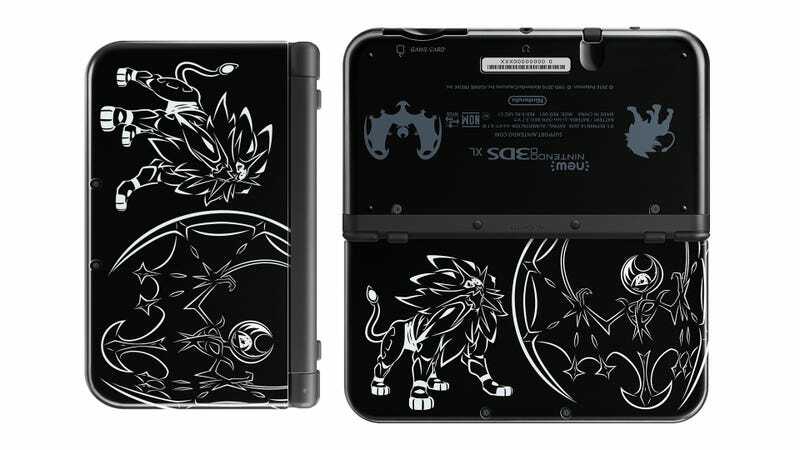 Earlier today, Nintendo announced a new limited edition Pokémon Sun and Moon 3DS XL arriving next month. Is this a must-have, or is it ugly, but not ugly-ugly? We’re conflicted. Nintendo’s not been having a great run of limited edition 3DS systems lately. Partial blame can be cast at the eagerly sought-after Majora’s Mask 3DS XL, though a lot of the panic over grabbing one of those rose from it being released with the general release of the console in North America. I always thought it looked like screen-printed fan art. Things have definitely taken a downward turn. Just a couple of weeks ago Nintendo made a big deal out of a 3DS XL that looks like someone searched “space wallpaper” and made a sticker. And now this black and white stylized thing. Probably would have been a nice design for one of those other Pokémon games. The black and white ones. Nothing about this screams “sun and moon” to me. Maybe if they had taken the galaxy background and placed the Pokémon over that? Mind you, we’ve not seen the inside yet. Maybe it’s the best inside ever, and that’s why she wouldn’t let me see a picture of her until we met in person. Long story. Ignore that. So, what do you folks think? Would you tap your debit card to pick one of these up, or stick with your old faithful?